Why haven’t you been to a cat cafe yet? It’s 2019, cat people! It’s not 2014 anymore, kit kats. Sure, we’d scarcely heard of a cat cafe in those early years of the decade. Cat cafes were an exotic destination, an internet novelty. But then the first cat cafe opened in California. In five short years, you can now find cat cafes in well over half of states in the country, with many states having multiple cafes. Cat cafe out of the bag? Cat cafe fever? 2018 proved to be giant year for cat cafe growth, with fifteen cafes opening across the country. 2019 promises to be the best year yet for cat cafes. The year is kicking off big with the grand opening of the first Cleveland cat cafe on January 2nd, and a new San Diego county cat cafe just ten days later. At least ten more cafes are slated to open, including the much anticipated Cat’s Meow Cafe opening in Miami in February and Meow or Never Cafe & Rescue opening in Las Vegas later this spring. 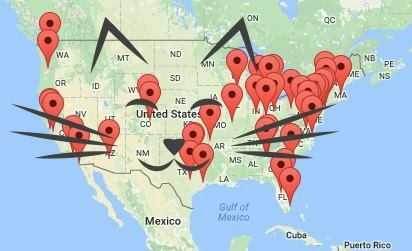 So now it is easier than ever to find a cafe near you! If you still don’t have one in your neighborhood, build a visit into your next trip. 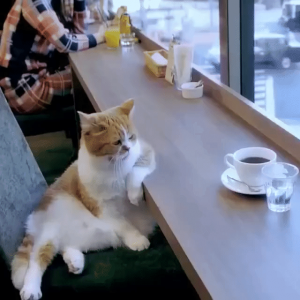 There’s good reason for why cat cafes are so popular: they’re AWESOME! A Cat Cafe is a coffee house concept that brings together adoptable cats and food in a relaxed environment to facilitate the adoption of shelter and rescue cats. In the United States, cat cafes typically partner with one or more rescue groups to find homeless cats a permanent home. Cats are free to explore the enriched environment while patrons enjoy refreshments and the feline companionship. Can I Bring My Cat to the Cat Cafe? This really is the first question people have about cat cafes. Seems cat people have an unrealized dream of taking our cats out on the town. No kittens, you can’t bring your cat. But you will enjoy meeting adoptable cats and maybe even consider taking one home!